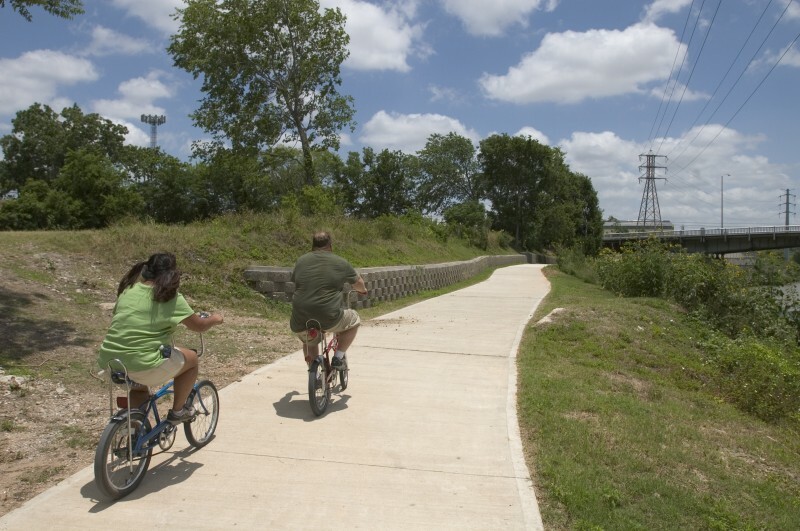 A top priority of Buffalo Bayou Partnership is to build a continuous system of trails on the north and south banks of Buffalo Bayou from Shepherd Drive to the Turning Basin. This will give Houstonians and visitors 20 miles of trails to run, walk and bike along our waterway. In partnership with the City of Houston and Texas Department of Transportation (TxDot), the Sandy Reed Memorial Trail from Shepherd Drive to Sabine Street was realigned and resurfaced. With the reconstruction of this trail, bicycling along the bayou is becoming even more popular. To accommodate residents and visitors who want to enjoy a walk or jog along the Shepherd Drive to Sabine Street stretch of the bayou, BBP added asphalt footpaths closer to the waterway. The organization is currently focusing on vital trail connections through downtown. There are already numerous trail segments west of downtown, but right now the trail ends with a concrete wall at Allen’s Landing. Construction was recently completed on one of the bayou’s most unique trails under a network of downtown streets. Connecting Smith Street at Sesquicentennial Park to Milam Street near Allen’s Landing is the $4.6 million “TIGER” trail which was funded through the highly competitive Transportation Investment Generating Economic Recovery grant program administered by the Federal Highway Administration. BBP contributed $1 million in matching funds which were donated by a BBP board member. Equally exciting downtown trail links are in the planning stage. One is to be located on Harris County and Harris County Flood Control District properties and will be funded by private donations and City of Houston funds. The second trail will be located on an easement donated by CenterPoint Energy. 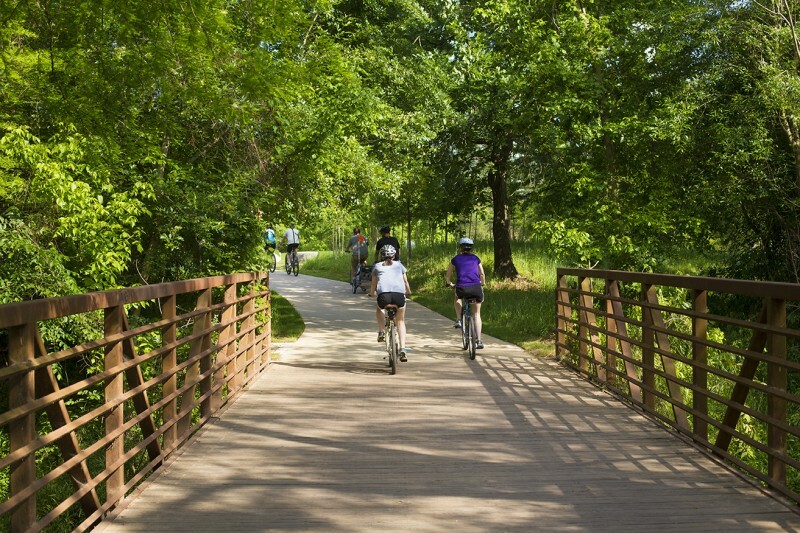 In Houston’s East End, more than four miles of hike and bike trails have been constructed by BBP primarily with private funds. The trails have been built incrementally as property owners have provided easements. Currently, the organization is focusing on several missing trail links. In partnership with the Texas Department of Transportation, BBP is working on a hike and bike trail at the Harris County Housing Authority’s Clayton Homes. In addition to the trail, a pedestrian bridge will be developed to provide first-time access from the south and north banks.